Screen porches are a pleasure in Wisconsin. The only thing better is a screen porch with a ceiling fan. Moving the summer air makes porch living a breeze, literally! Not sure where to start? Here are a few things to consider. 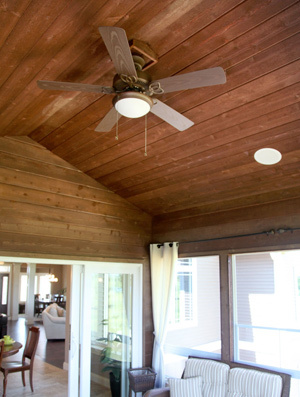 We recommend ceiling fans for damp or wet locations when installing on a porch. Heavy humidity and crazy temperature swings affect a ceiling fan, so choose wisely. And size matters. The span of the blades should be proportionate to the space. Perhaps even more important is the motor size. Pushing humid air is hard work, select the right motor for the job. And finally, style. Your ceiling fan should look nice with the style of your house, your exterior lighting, and the furniture on your porch. We can help you get ready for porch livin’ this summer.